Please select an option Black Blue Grey Khaki Eggplant Please select a chooseacolor. Practical, stylish and organize to the max!!! 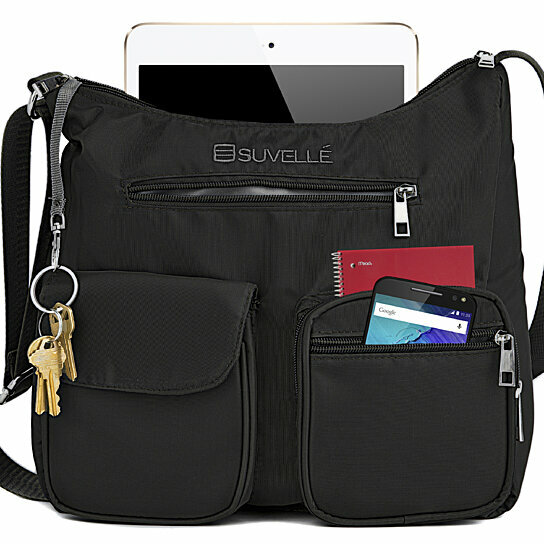 The Suvelle carryall bag offers multiple options for storing your essentials and to carry everything you need for a day out, while the RFID blocking card slots shields your identity from readers or scanners, now you can go about your days worry-free and always look stylish!!! Exterior Dimensions: 11.5" x 11" x 4.5" Linear Inches: 27" Strap Drop Length: 28" Weight: 11 oz Material: Water-Resistant and Stain Resistant Crinkle Nylon:Practical, stylish and organize to the max! The Suvelle carryall bag offers multiple options for storing your essentials and to carry everything you need for a day out, while the RFID blocking card slots shields your identity from readers or scanners now you can go about your days worry-free and always look stylish!